We’re on the road once again, this time taking the long way to Arizona to see more of Canada on the way. We left on Wednesday, September 2nd and spent the first night at Carol’s Campsite at Sudbury. Other than the fact that when I opened the fridge to get out the makings for dinner I discovered that the fridge had been off, it was an uneventful afternoon of driving (it was after noon when we finally got on our way). The next morning I moved some food items into the electric cooler, thankful that I’d brought it along this trip. Later Jim solved the problem with the fridge and all is good now. 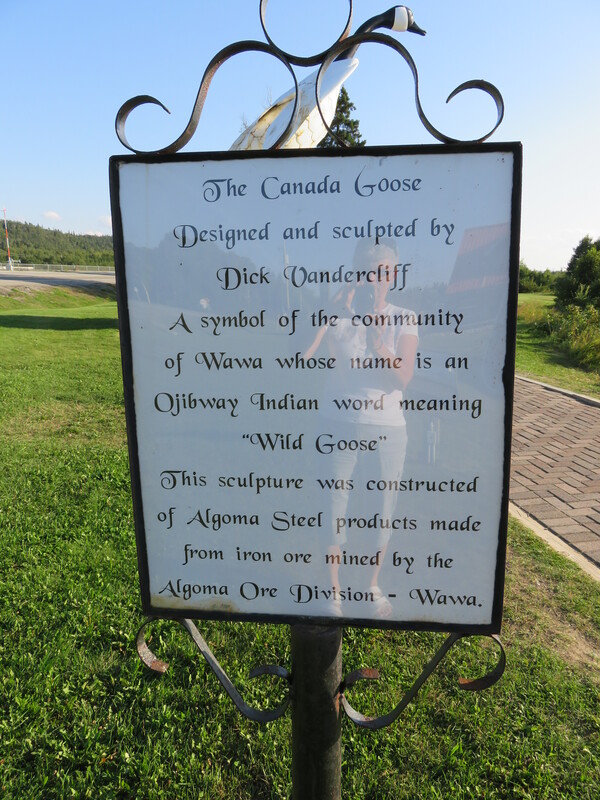 We continued onto our next destination, Wawa, Ontario where we stopped at a Good Sam Park for the night. Internet connections have been poor, so I made no attempts at blogging. We were lucky to get emailing done. Even our phones were often out of service amongst the hills and trees of that part of the province. I thought we’d given ourselves plenty of time to get to BC for a few weeks before turning south, but when we stopped in Wawa I was already wishing we’d scheduled more time so we could spend a day exploring there. We met a couple outside the Welcome Centre,who were slowly making their way back home to Qualicum Beach in BC, having traveled all the way to Montreal in a very old, wide-body camper van, similar to the one we owned for a few weeks before deciding we needed something larger for doing long trips. They had been there all day, just enjoying the beauty and catching up on internet tasks (WiFi was good there). They told us of the beautiful beach in downtown Wawa that we should visit, but we had to keep moving; we had made plans to visit family along the way. 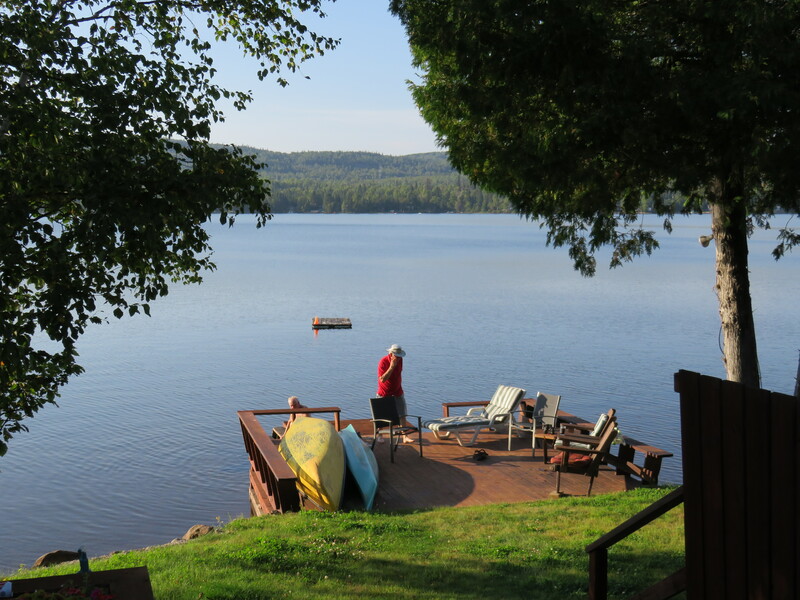 On Friday we decided to look up some Mesa Regal friends, who spend their summers on Loon Lake, in the small community of Shuniah, which is just east of Thunder Bay. While motoring along highway 17, we were startled by the flashing lights and a siren when a police car suddenly passed us. A minute later, a small red car cut in front of us, just missing an oncoming transport. It then passed the transport in front of us, forcing an oncoming car onto the shoulder! That was followed by second police car, also in warning mode, and cutting in and out of traffic. We both sat with our jaws dropped. How close had we come to being involved in a terrible crash? We arrived at Loon Lake at 5:00 pm to find Harp and Joan thrilled to have us. Unfortunately the cottage turned out to be on a dead end road and there wasn’t a lot of space to turn our big rig and trailer around. Harp, his son Sandy, and I tried to direct Jim back into a narrow driveway, but cedar trees on one side stopped him, and when he attempted to drive forward to straighten out, the motor home was uphill, the trailer down. This resulted in the trailer hitch becoming buried under the gravel of the road. I left the men to rectify that situation and remove the trailer, while I went indoors to help Joanie with dinner. By the time it was about ready, the motor home was parked out front, facing the right direction to get us out of there, and the trailer was again connected. 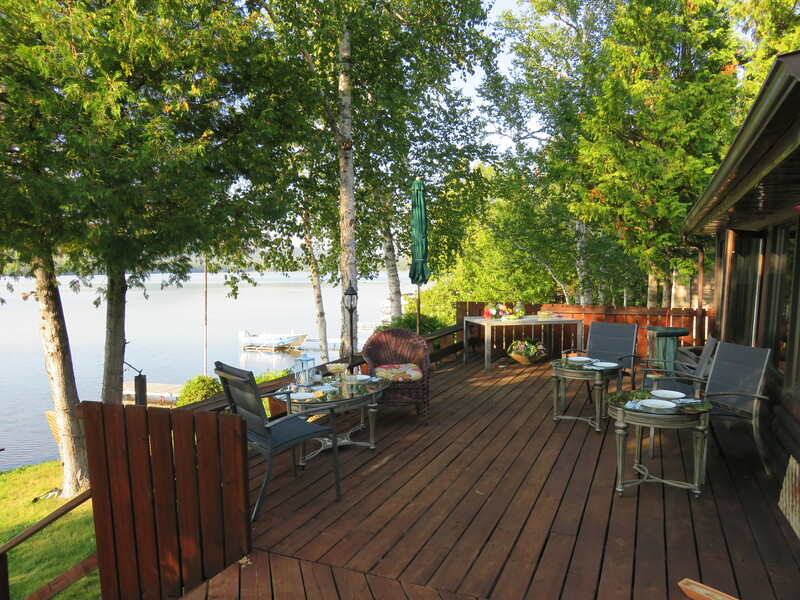 We could all relax and enjoy a drink on the dock before partaking of a delicious meal on the deck. We spent the night there in the RV and shared breakfast with Joanie and Harp before leaving the next day. Again, we would have liked to stay longer. It’s a beautiful spot. 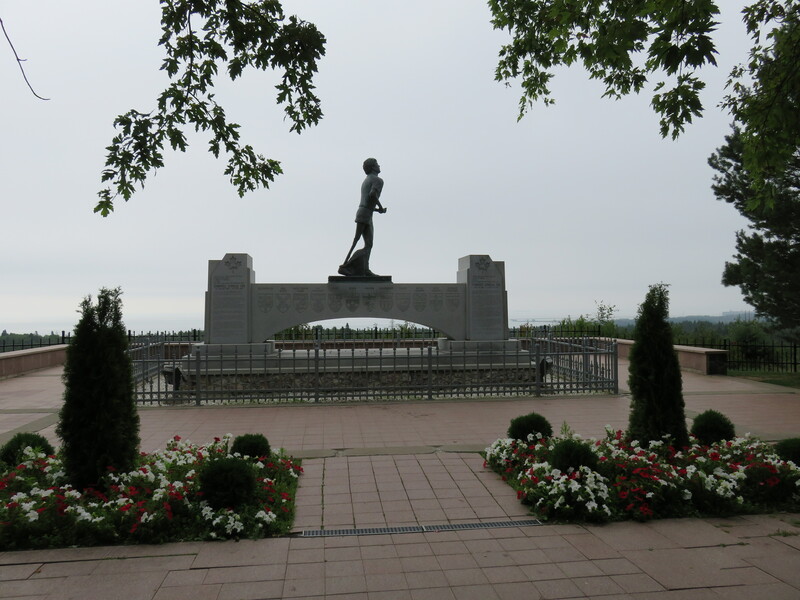 We stopped at the Terry Fox Memorial at Thunder Bay. The story still brings tears to my eyes, as it did when I tried to read about this brave young fellow back in 1981. So far the weather had been sunny, hot and humid. 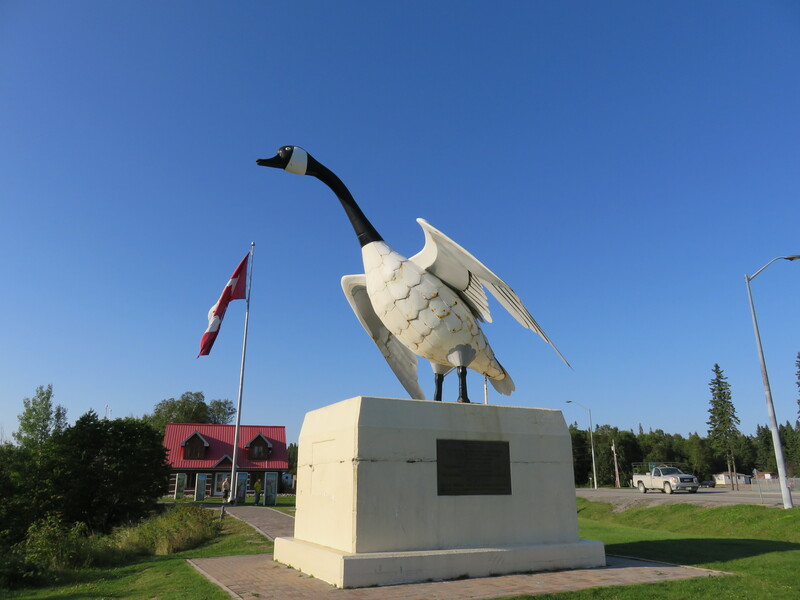 We made it to the outskirts of Kenora on Saturday night before stopping at The Willows RV Campground. Around 9:00 pm the rain began, followed by thunder, lightning and wind. It stopped for a while, but after we got to bed it started again. The rain pounded on the roof for a half hour or more, not a gentle rain to put me to sleep. In the morning the park owner was out with his little back hoe leveling out some of the holes in the roads caused by the storm. 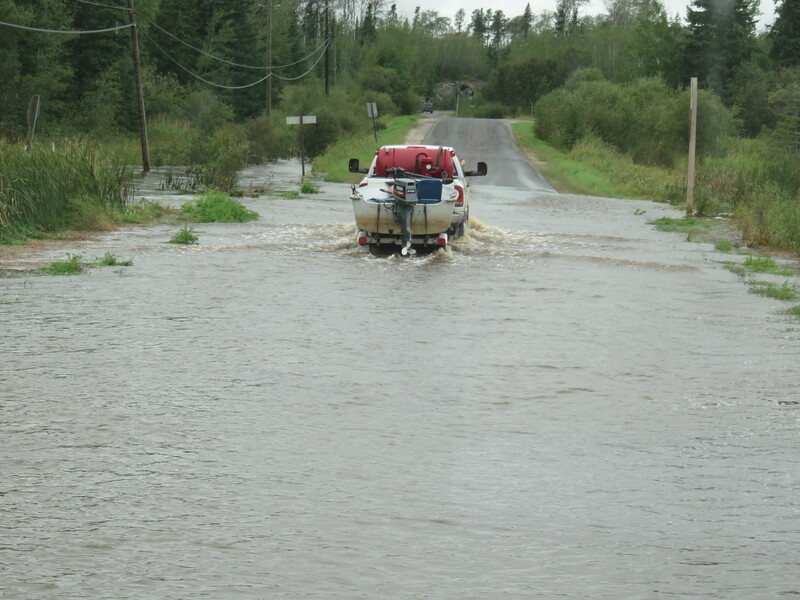 When we left the park an hour later, we watched two pickup trucks slowly make their way through a flooded area of the road we needed to take, then held our breath as we edged through it too. Yes, we had to go through that! 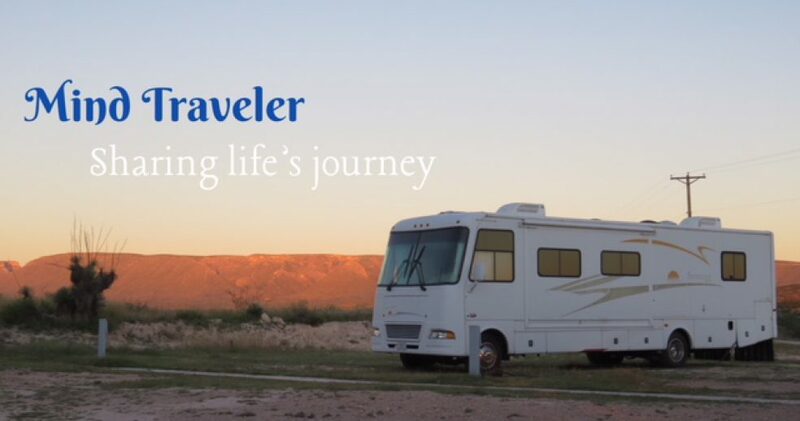 This entry was posted in Active Seniors, Adventure, RV Travel, RVing and tagged Kenora, Ontario, RV Travel, Thunder Bay, Wawa. Bookmark the permalink. You are having an adventure. Love to hear more as your journey continues.